For this article, I’d like to shift my focus from the world to a specific place – Washington DC. 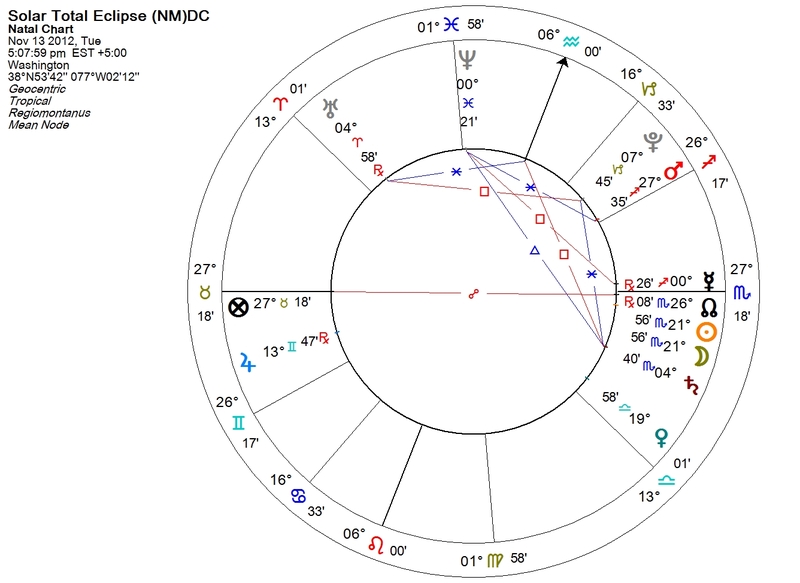 Since 27 degrees of Taurus rises in this chart, one could either consider the Eclipse to take place in a quadrant-based system in the 6th House, or in Whole Sign houses in the 7th. Either way, a Venus in Domicile rules the chart from a Cadent house. There is also a Mutual Reception by Domicile between Mercury and Jupiter. Let’s explore the possibilities. The Sun and Moon are both Peregrine – that is, without Essential Dignity. Additionally, the Moon is in Fall – making it even less comfortable. By Whole Sign House, they are angular – but not comfortable in their roles. They are disposed by Mars, placed in Sagittarius – where he is not usually comfortable – but he has Essential Dignity by Term. Dignity by Term denotes a normal functioning of an everyday individual. If we go back to Plato, he is neither Gold nor Silver, but Bronze. No leader, no artist – but a workman. The Dispositor of Mars is Jupiter, who is – as stated above – in Mutual Reception by Domicile with Mercury. Therefore, the Sun/Moon/Mars chain winds up stuck on the Jupiter/Mercury see-saw. One might say there is an inner dialog in that configuration that goes something like, “Expand!” “No, we have to think about it more!” And since both are retrograde, neither has the impetus to move forward at this point. The Venus in Libra, from a position of comfort and ease has difficulty acting. The peacemakers have the best ideas, but can’t act on their own. And there are no major aspect outlets to help. The eclipse point is equal to the Uranus/Pluto midpoint (45 degree aspect), so the impetus to overwhelming change is there. But there is an inability to act decisively seen in this chart. Another thing to consider is the fact that Mars has moved Out of Bounds by declination. Could Mars violence cause things to come to a head? Mars is in the Term of Saturn – and Saturn is in the Term of Mars, so there is a Mutual Reception by Term between them. It is also a Saturn Hour during a Mars day. Might this be the see-saw battle between an irresistible force meeting an immovable object? I think, in this case, Mars will break through. If we compare this to my preferred Declaration of Independence (which I use amongst other USA charts – mostly to denote the USA nation, not its government) for around noon on 4 July 1776 we see Venus in that area, shoring up the exalted rising Saturn. Pluto, is also currently in the degree of the 4 July 1776 nodal axis. Anything in the degree of the nodes can be very problematic – Pluto doubly so.. Troubling. Drawing people toward realities they would rather not face. And if you follow the mid-Libra rising chart as I do, Pluto is heading toward the IC. Fundamental change. I hope that Venus by her strength can save the day.